It was several days into the shutdown before GSA officials realized that closing the Old Post Office’s observation tower was not appropriate. The line between the hotel and NPS-run clock tower can seem blurry. Access to the tower is not through the hotel’s logo-clad Pennsylvania Avenue entrance. Nor is it through the 11th Street entrance used by patrons of the hotel. “Go to the Starbucks off 12th Street,” a hotel receptionist said when Government Executive visited on Monday. 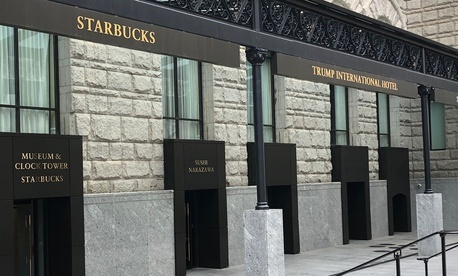 In a courtyard at Federal Triangle across from the Internal Revenue Service headquarters, signs for the Park Service tower entrance gleam alongside co-equal signs for the coffee chain’s outlet and the Trump hotel proper. Visitors then enter a hallway lined with framed prints of early District of Columbia sights, followed by a gift shop selling Trump Organization swag (no campaign slogans), near a desk worked by a private security guard. Next, you navigate a hallway packed with exhibits on the history of the Old Post Office (built in a high-crime neighborhood from 1891-99). The elegant building was preserved, in part, due to efforts by Nancy Hanks, the first chairman of the National Endowment for the Arts (which was housed in the building before it was leased to the Trump organization). Access to the elevator to the 9th floor landing—which offers a bird’s eye view of the Trump hotel’s courtyard and bars—includes an encounter, on different floors, with three Park Service rangers. Then the visitor arrives at the open-windowed 12th floor tower, supervised by another private security guard. There one can examine the clock’s 19th-century machinery and behold four-sided views of downtown Washington D.C. On display are signs with keys identifying specific landmarks of a city that is home to a national government that is currently one-quarter shut down. Critics of President Trump’s half-private, half-public arrangement at the hotel were unlikely to ignore what they see as irony in the hotel site’s special exception to an appropriations-lapsed Park Service.